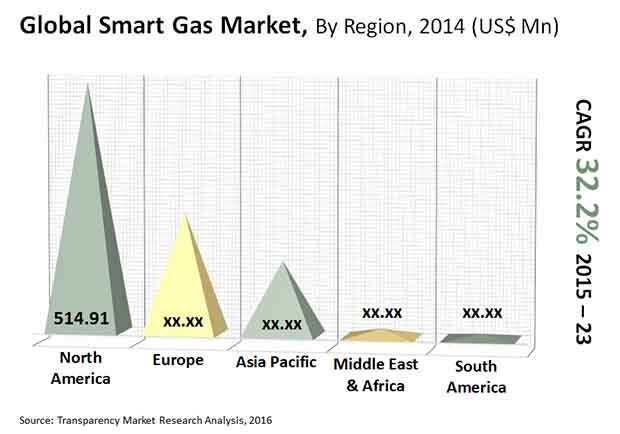 The presence of a large number of players with minimum product differentiation is resulting in a highly competitive nature of the global smart gas market. The leading players in the market, include General Electric, Itron Inc., EnerNOC Inc., Elster Group GmbH, and Sensus Metering Systems. Transparency Market Research (TMR) observes that these players are involved in backward integration to stay ahead in the market. “The high capital investment and proprietary knowledge required for the manufacturing and distribution of smart gas meters is restricting new players from entering the market. However, government regulations and strategic partnerships could help new players in overcoming high entry barriers,” says TMR’s lead analyst. The capital intensive nature of the global smart gas market also makes the exit barriers high. The global smart gas market is projected to rise to a valuation of US$10.56 bn by 2023 from US$1.39 bn in 2016, progressing at a remarkable CAGR of 32.2% from 2015 to 2023. By device, the AMI communications gas module segment will continue to dominate until 2023, representing over 76.5% of the overall market. The ability of these devices to cut down costs by eliminating the need for site visits and allow remote monitoring gas meters is stirring up their demand. The demand for gas warning device is poised to increase at a significant pace during the review period. Geographically, North America dominated the market in 2016. However, Europe is anticipated to surpass North America during the forecast period. The phenomenal growth of the former can be largely attributed to the initiatives taken by the European Union (EU). The South and Central America is estimated to exhibit a noteworthy CAGR of 47.1% in terms of revenue during the same period. Governments worldwide have launched several initiatives such as the Energy Company Obligation (ECO), Green Deal, and Central Heating Fund (CHF) that encourages energy companies to install smart gas meters for their customers. “Smart gas meters are capable of increasing the efficiency of gas usage by 5%-15% and concurrently reducing carbon footprints,” says a TMR analyst. As per the 2014 directives, the EU is expected to roll out 45 million smart gas meters by 2020. Therefore, government initiatives and regulations play a pivotal role in the growth of the global smart gas market. The growing emphasis on energy security and preventing loss caused due to gas theft is segmenting the demand for smart gas meters. These meters are more reliable and secure than conventional meters as they are equipped with multiple layer security systems to comply with the underlying objective of meeting energy security. Besides this, these meters avoid feeding wrong information to process billing as they are automated and have no room for manual errors, thereby eliminating loss of revenue. The growth of the global smart gas market is adversely affected by the high initial investment required for the installing smart gas meters. The cost of setting up communication modules, gas warning devices, data logging and monitoring software, and flow measurement devices is high. In addition, the cost of distribution automation devices for smart gas meters is higher as compared to smart electricity meters. This brings much of the onus on governments worldwide as the initial installation of smart gas meters is not economically feasible without their support in terms of subsidies or grants. The lack of regulatory framework and investment schemes in the Middle East is, therefore, inhibiting the growth of the market. However, the growing popularity of smart gas meters is offering lucrative opportunities for the growth of the market.